Although LCC's Jacob Stanford is the front-runner on his own team, it isn't by much. Victories in the Bronco, Mt. Carmel and Stanford Invitationals mark the senior as one of the very early favorites in Division II. No surprise there as he was fourth in the state in the Division III championships a year ago. But he's far from dominant, even in his own family, as twin brother Garrett is steadily moving back up the list after suffering a foot injury that sidelined him from serious practice. After placing second in the Southern California Invitational last weekend, Garrett said he had felt comfortable the past two weeks in training. Considering that Jacob and Caleb Niednagel are his training partners, staying with those two is indeed a big step up. Garrett, when 100 percent, is just as likely to cross the finish line first as his twin brother, as shown by his fifth place finish a year ago at state. But both might be pushing Niednagel, who won the SoCal race by 11 seconds. Niednagel appeared to be adjusting to LCC after transferring from Dana Hills over the summer and he clearly is now a full-time Maverick who actually ran a faster time in last year's state finals than either of the twins, but in a different division. 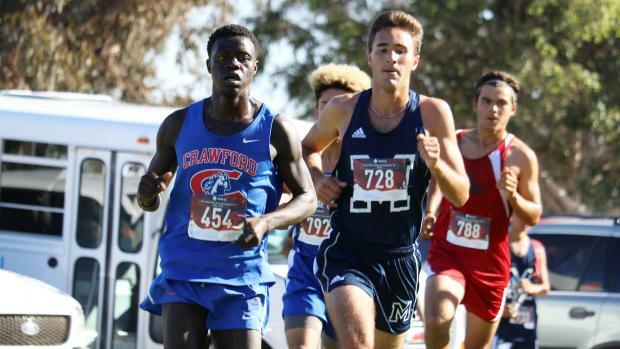 While the Mavericks trio has been grabbing the headlines, quietly two other area runners, El Capitan's Matt Machnov and Crawford's Nader Ali, appear poised to make some noise provided they continue to improve. Ali, who placed 12th at state in Division IV a year ago, is a smooth-striding native of Sudan who moved to Egypt before coming to the United States and was recruited out his school's halls because, according to his coach Tlaloc Venancio, "...had the physique; he had the posture. I thought he could be a state champion one day, so I recruited him." Ali hasn't disappointed his coach who is a firm believer in peaking at the end of the season. He was given a chance to see where he stood by running in the Coach Jerry Downey Classic, which features only Division IV and V schools. The race is held at Morley Field, site of the Foot Locker Nationals, and Ali won easily by 20 seconds, covering the 5,000-meter course in 16:03. Since Ali is more concerned about where he stands compared to last year, that's a 48 second improvement. Improve 48 seconds at state, and, well, you get the idea. Machnov finished 14th at state in Division III a year ago, running behind four San Diego Section competitors in the section's deepest division. Two of those rivals graduated and the other two moved up a division, so Machnov is hoping, with continued improvement and some competition, to get into the top 10-at least. Other runners who are quietly faring well include Sage Creek's Daniel Rubin and Justin Morris and San Pasqual's Frank Varela and Noah Tellez-Velazquez.